Buffalo wings are good, and so are drumsticks slathered in BBQ sauce. But when cookout guests demand the boldness of the hot stuff paired with the sweetness from the south, you'll want to whip up a batch of these puppies. Heat grill to medium heat. 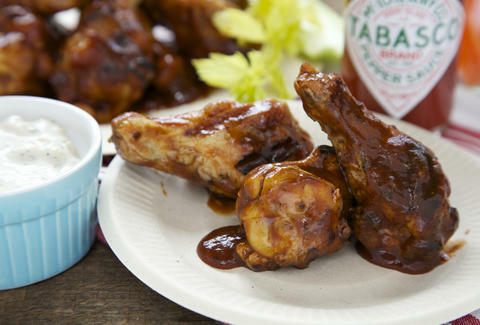 Combine barbecue sauce and TABASCO® Original Red Sauce in a large bowl and set aside. Place wings on grill and cook until crisp and cooked through, about 15 minutes. Transfer hot wings to the large bowl and toss until wings are well coated. Serve immediately.